Background and objectives The complement inhibitor eculizumab has dramatically improved the outcome of atypical hemolytic uremic syndrome. However, the optimal duration of eculizumab treatment in atypical hemolytic uremic syndrome remains debated. We report on the French atypical hemolytic uremic syndrome working group’s first 2-year experience with eculizumab discontinuation in patients with atypical hemolytic uremic syndrome. Design, setting, participants & measurements Using the French atypical hemolytic uremic syndrome registry database, we retrospectively identified all dialysis–free patients with atypical hemolytic uremic syndrome who discontinued eculizumab between 2010 and 2014 and reviewed their relevant clinical and biologic data. The decision to discontinue eculizumab was made by the clinician in charge of the patient. All patients were closely monitored by regular urine dipsticks and blood tests. Eculizumab was rapidly (24–48 hours) restarted in case of relapse. Results Among 108 patients treated with eculizumab, 38 patients (nine children and 29 adults) discontinued eculizumab (median treatment duration of 17.5 months). Twenty-one patients (55%) carried novel or rare complement genes variants. Renal recovery under eculizumab was equally good in patients with and those without complement gene variants detected. After a median follow-up of 22 months, 12 patients (31%) experienced atypical hemolytic uremic syndrome relapse. Eight of 11 patients (72%) with complement factor H variants, four of eight patients (50%) with membrane cofactor protein variants, and zero of 16 patients with no rare variant detected relapsed. In relapsing patients, early reintroduction (≤48 hours) of eculizumab led to rapid (<7 days) hematologic remission and a return of serum creatinine to baseline level in a median time of 26 days. At last follow-up, renal function remained unchanged in nonrelapsing and relapsing patients compared with baseline values before eculizumab discontinuation. Conclusions Pathogenic variants in complement genes were associated with higher risk of atypical hemolytic uremic syndrome relapse after eculizumab discontinuation. Prospective studies are needed to identify biomarkers predictive of relapse and determine the best strategy of retreatment in relapsing patients. The introduction of anti–C5 complement inhibitor eculizumab has been a breakthrough in the management of atypical hemolytic uremic syndrome (aHUS). In prospective, although noncontrolled studies and retrospective series, this disease-specific treatment has significantly decreased the risk of ESRD in patients with aHUS from 60%–70% (1–3) to around 15%–20% in adults (4–6) and from 30%–40% (1) to around 5%–10% in children (7,8). Currently, one of the most debated questions regarding the use of eculizumab in aHUS is the duration of therapy. Several arguments plead against or for eculizumab discontinuation in these patients. On one hand, pathogenic variants leading to permanent complement dysregulation are detected in only 40%–60% of patients with aHUS (1,3). Although complement alternative pathway activation occurs in virtually all patients during the acute phase of aHUS, regardless of the presence or absence of complement genes variants (9,10), it is unclear whether this activation persists in all patients during remission and remains clinically relevant. Moreover, eculizumab therapy over decades is associated with an increased risk of meningococcal infection, requires regular admissions to the hospital if the home care setting is lacking, and is costly. On the other hand, aHUS carries a risk of relapse after eculizumab discontinuation, and relapse may lead to AKI, irreversible CKD, ESRD, and potentially, neurologic and cardiovascular manifestations. In the pre-eculizumab era, the risk of relapse was estimated around 20%–30% and particularly high during the first year (except in children with membrane cofactor protein [MCP] variants, of whom 58% had the first relapse after the first year) (1). However, the most severe forms of the disease (complement factor H [CFH] and C3 variants) are now rescued from ESRD with the use of complement blockade, and thus, the risk of relapse after eculizumab discontinuation may be higher compared with that in the pre-eculizumab era. Two years ago, pediatric and adult nephrologists in the French aHUS/C3G working group agreed on assessing the feasibility of eculizumab discontinuation in patients with aHUS. We report herein our experience with eculizumab discontinuation in 38 children and adults with aHUS. We identified all patients with aHUS who discontinued eculizumab (Soliris; Alexion Pharmaceuticals) using the French aHUS registry, a nation-wide database that virtually includes all patients with aHUS diagnosed in France. We reviewed the patients’ relevant clinical, biologic, and genetic data. The decision to stop eculizumab was made by the clinician in charge of the patient after at least 3 months of stabilization of renal function and proteinuria. All patients received information regarding the benefits and risks of eculizumab discontinuation and were closely monitored after eculizumab discontinuation by regular (once or twice weekly) dipsticks (proteinuria and hematuria) performed by the patients and blood tests (serum creatinine [SCr], hemoglobin, platelet count, schizocytes, lactate dehydrogenase, haptoglobin, and proteinuria-to-creatinuria ratio [P/Cr]) every week for 1 month, subsequently every 2 weeks for 3 months, and monthly thereafter. All patients were informed of the urgent need to (1) consult their physician in case of clinical or biologic signs suggestive of aHUS relapse and (2) restart eculizumab treatment within 24–48 hours after the diagnosis of relapse. Initial flare of aHUS was defined by the occurrence of at least three of the following criteria: thrombocytopenia (platelet count <150,000 103/μl), mechanical hemolytic anemia (defined by at least two criteria: hemoglobin <10 g/dl, lactate dehydrogenase greater than the upper limit of normal, undetectable haptoglobin, or presence of schizocytes on blood smear), AKI (SCr greater than the upper limit of normal for age or an increase >15% compared with baseline levels), appearance or increase >25% in P/Cr compared with baseline, and a kidney biopsy disclosing features of thrombotic microangiopathy (glomerular and/or arteriolar thrombi, doubles contours, or endothelial cells detachment). A relapse was defined by the occurrence of at least two of these criteria, because regular and close follow-up of patients after eculizumab withdrawal may lead to the diagnosis of a relapse (and reintroduction of eculizumab) before the complete picture of aHUS is present. All included patients had detectable (>10%) a disintegrin and metalloprotease with thrombospondin type 1 repeats-13 activity measured during the first episode of aHUS. Patients in whom eculizumab was discontinued because of the absence of any renal function recovery (dialysis dependent), those with secondary hemolytic uremic syndrome (cancer, autoimmune diseases, drugs, or infections), and renal transplant recipients were excluded. CKD was defined by an eGFR below 60 ml/min per 1.73 m2 (Modification of Diet in Renal Diseases  and Schwartz  formulas were used for adults and children, respectively). Biochemical assays of complement proteins, including screening of antifactor H (anti-FH) antibodies, were performed at the time of diagnosis. All patients underwent a routine screening for complement genes variants in CFH, complement factor I (CFI), MCP, and C3 and complex rearrangement between CFH and CFHR1 as previously described (1), independent of the decision to discontinue or not discontinue eculizumab. On the basis of genetic screening results, patients were classified in two groups: (1) patients with a novel or known rare variant (minor allele frequency <0.1%) in aHUS-associated genes (C3, CFH, CFI, complement factor B, or MCP) or anti-CFH antibodies and (2) patients with no identified rare variant (minor allele frequency <0.1%) and negative anti–CFH antibody (13). Data are shown as medians (full ranges) or percentages. Statistical tests were performed using chi-squared, Mann–Whitney, or paired t tests and Kaplan–Meier estimates (relapse-free survival; Prism software). The process of selection of these patients is depicted in Supplemental Figure 1. Among 108 patients with aHUS treated with eculizumab between 2010 and 2014, two died (unexplained sudden death in one adult and multiorgan failure in one child); 11 remained on dialysis, among whom one had aHUS relapse (thrombocytopenia and hemolysis) after nephrectomy for renal adenocarcinoma, and eculizumab was resumed. Thirty-four patients were maintained on eculizumab, and 44 patients discontinued treatment, among whom six were lost to follow-up. Thus, 38 patients (24 women) were included in the analysis. Eculizumab discontinuation was decided by the clinician and the patient who received information regarding the benefits and risks of treatment cessation. No eculizumab discontinuation was related to the drug’s side effects. Patients’ clinical and biologic data are summarized in Table 1 (shown in detail in Supplemental Figure 2). There were nine children and 29 adults. An aHUS episode that led to the use of eculizumab occurred postpartum in two patients (patients 10 and 36) and in the setting of acute pancreatitis in one patient (patient 29), and it was characterized by the triad of AKI, mechanical hemolysis, and thrombocytopenia in all patients. Novel or rare variants were identified in 21 patients (55%). Complete complement workup with genetic variants is shown in Table 2. C3 and FH serum levels were decreased in four patients (patients 1, 4, 7, and 9). All patients had heterozygous variants, except patient 4, who had a homozygous CFH pathogenic variant. Eleven patients (11 of 38; 29%) carried a CFH variant (n=9), a hybrid CFH-CFHR1 gene (n=1), or combined CFH/CFI pathogenic variants (n=1) (14,15). Nine of 11 variants (72%) in the CFH gene are associated with a quantitative (four of 11 with low CFH and C3 in plasma) or functional defect (five of 11 variants located in Complement Control Protein 20 [CCP20], a domain crucial for complement regulation on endothelial cells [16–19]). Functional studies are not available for two rare variants located in CCP2 (patient 10) and CCP4 (patient 3), two domains implicated in C3b binding and fluid–phase regulatory activity of FH. Eight patients carried a variant in MCP gene (eight of 38; 21%). All variants but one were associated with a decrease of MCP expression on granulocytes and are classified as pathogenic. Two patients carried a pathogenic variant in the CFI gene, leading to quantitative deficiency, including one patient with combined CFH and CFI variants (patient 8) (14,15) and one patients with a variant in the C3 gene without identified functional consequences (20). One patient had high–titer anti–FH antibodies associated with a complete deletion of CFHR1–CFHR3 genes. Median duration of eculizumab treatment was 17.5 months (2–50). Despite severe renal involvement at presentation (47% of patients requiring dialysis) (Table 1), renal outcome of eculizumab-treated patients was excellent, with median SCrs at the time of eculizumab discontinuation of 1 mg/dl (0.7–2.8) in adults and 0.45 mg/dl (0.25–0.46) in children. Only four patients (patients 22, 23, 33, and 36) retained CKD. Patients with and without complement genes variants detected had a similar severity of AKI at presentation (adults: median SCr =8.4 [3–12.1] versus 6.6 [1.3–13.3] mg/dl; P=0.75; ten of 14 [71%] requiring dialysis versus eight of 14 [57%] in the two groups, respectively; children: SCr=1.8 [0.2–3.9] versus 1.9 [0.65–1.9] mg/dl; P=0.45; only one child without variant required dialysis). Renal function recovery under eculizumab was similar in adults and pediatric patients with and without complement genes variants detected (Supplemental Figure 3). Twelve patients remained hypertensive (patients 7–9, 11, 21, 23, 26, 30, 34, 35, and 37). Three adults had mildly increased P/Cr (patient 1 [800 mg/g; normal <150 mg/g], patient 7 [1400 mg/g], and patient 14 [880 mg/g]), and two children had detectable microalbuminuria (patient 2 [415 mg/g] and patient 13 [130 mg/g]). Median follow-up after eculizumab discontinuation was 22 months (5–43). Twelve patients (32%) experienced aHUS relapse after eculizumab discontinuation, with a median time to relapse of 7.5 months (3–29) (Supplemental Figure 2, Table 1). Eight of 11 patients (72%) with CFH variants, four of eight patients (50%) with MCP variants, and none of the patients with no variant detected relapsed. Median time to relapse after eculizumab discontinuation was 6.5 months (3–22) in patients with CFH compared with 10.5 months (6–29) in patients with MCP (P=0.66). In two patients, aHUS relapse occurred after anti-influenza vaccination (patient 2) and an upper respiratory tract infection (patient 19). Seven of eight patients with CFH variants who relapsed after eculizumab discontinuation carried variants associated with documented quantitative or functional deficiency (Table 2). One additional patient of the three who carried a likely pathogenic variant in CFH gene relapsed. One patient with the C3 variant, one with the CFI variant, and the single patient with anti-CFH antibodies that became persistently negative after treatment did not relapse. The main differences between relapsers and nonrelapsers were a history of previous aHUS episodes before eculizumab use and the frequency of complement genes variants (Table 3). Adult relapsers tended to be younger than nonrelapsers, but this may be due to the fact that adults with variants were younger than those without variants (27 [21–55] versus 39 [25–79] years old; P=0.02). A history of aHUS relapse before the use of eculizumab was more frequently noted in relapsers versus nonrelapsers after eculizumab discontinuation (50% versus 11%; P=0.03), but eight of nine patients (89%) with such history also carried complement genes variants versus 12 of 28 patients (43%) without (P=0.02). The hazard ratio for aHUS relapse is shown in Figure 1. The 3-year risk of aHUS relapse after eculizumab discontinuation was significantly higher in patients with pathogenic variants in MCP (P=0.001; odds ratio, 25; 95% confidence interval, 1.1 to 594) or CFH (P<0.001; odds ratio, 80; 95% confidence interval, 3.7 to 1737) genes compared with patients with no identified variants. Risk of atypical hemolytic uremic syndrome relapse after eculizumab discontinuation varied depending on the presence or absence and type of variants in complement genes. Kaplan–Meier estimate of atypical hemolytic uremic syndrome (aHUS) relapse-free survival after eculizumab discontinuation in patients with pathogenic variants in complement factor H (CFH) or membrane cofactor protein (MCP) or no detected pathogenic variants in complement genes. The 3-year risk of aHUS relapse after eculizumab discontinuation was significantly higher in patients with pathogenic variants in MCP (P=0.001; odds ratio, 25; 95% confidence interval, 1.1 to 594) or CFH (P<0.001; odds ratio, 80; 95% confidence interval, 3.7 to 1737) genes compared with patients with no identified pathogenic variants. No significant difference was noted between patients with pathogenic variants in CFH and MCP genes (P=0.16). All but one patient who relapsed presented with mechanical hemolysis and AKI, with median SCrs of 1.9 (0.95–3.2) and 0.74 (0.6–1.4) mg/dl in adults and children, respectively (Supplemental Table 1). Thrombocytopenia was present in seven patients at relapse. Two patients (patients 9 and 11) with normal platelet count at relapse underwent a kidney biopsy that disclosed features of active thrombotic microangiopathy (presence of thrombi). Patient 14 with MCP variant and a history of six aHUS flares before receiving eculizumab had a progressive increase in P/Cr starting 6 months after eculizumab discontinuation (maximum of 2200 mg/g) in the absence of AKI, thrombocytopenia, and hemolysis. A kidney biopsy disclosed significant fibrotic changes (seven of 25 [28%] sclerotic glomeruli, 20% interstitial fibrosis) and double contours aspects but the absence of fresh thrombi. The reinitiation of eculizumab led 2 months later to a decrease in P/Cr (130–175 mg/g). Eight months later, a second attempt at eculizumab discontinuation was associated with an increase in P/Cr (530 mg/g), eculizumab was restarted, and P/Cr decreased to 130 mg/g. In all relapsing patients, eculizumab was rapidly (<48 hours) resumed. Platelet count normalized in a median time of 5.5 days (3–7). SCr and proteinuria returned to normal values or baseline levels in median times of 28 (6–62) and 31 (8–210) days, respectively. The median follow-up for all patients was 22 months (5–43; 21.5 months [14–38] in relapsing patients). At last follow-up, there was no significant modification in eGFR compared with values noted at the time of eculizumab discontinuation (74 [26–123] versus 71 [25–135] ml/min per 1.73 m2; P=0.16 in adults; 125 [100–142] versus 116 [94–144] ml/min per 1.73 m2; P=0.14 in children), including in patients who had experienced a relapse (t paired test; P=0.22 in adults; P=0.32 in children). Ten patients who had relapsed were still receiving eculizumab at last follow-up. In one patient with MCP variant (patient 12), eculizumab was administered for 3 months and then stopped without any additional relapse. Eleven patients remained hypertensive: four relapsers (patients 7–9 and 11) and seven nonrelapsers (patients 21, 23, 26, 30, and 34–36). Two nonrelapsing adults had persistent mildly increased P/Cr (patient 14 [530 mg/g] and patient 30 [880 mg/g]), and one relapser had persistent proteinuria (patient 4 [0.8 g/L]). Two children had detectable microalbuminuria: one relapser (patient 2 [245 mg/g]) and one nonrelapser [patient 13 [95 mg/g]). The decision to stop or continue eculizumab is mainly on the basis of the assessment of the risk of relapse after treatment discontinuation, but it also takes into account additional factors, such as the age of the patient, the partial or complete recovery of renal function, whether aHUS affects the native or transplanted kidney, the occurrence of severe extrarenal manifestations, and the willingness of the patient to stop or not stop the treatment. Limited data regarding eculizumab discontinuation in patients with aHUS have been previously published. Ardissino et al. (21,22) reported on ten patients who stopped eculizumab, and 16 additional case reports are available from two small series from the United Kingdom (23) and The Netherlands (24) and isolated reports (reviewed in ref. 7). The overall relapse rate was 19%, the risk being the highest in patients with CFH variants (five of nine patients) However, some of these patients were dialysis dependent (seven of 36) and had been treated with eculizumab for a highly variable duration ranging from 2 weeks to several months, which may preclude firm conclusions. We report on the largest series to date of patients with aHUS, in whom eculizumab was discontinued after a period of treatment of at least 6 months (except for in three patients with MCP variants and two with no variant identified). Our data indicate that the presence and type of complement genes variants detected do not affect the response to eculizumab but are major predictive factors for aHUS relapse after eculizumab discontinuation. The risk of relapse after eculizumab discontinuation was the highest in patients with CFH variants (72%), reflecting the overall severity of the disease in these patients, which is in accordance with previous reports (21,23,24). This risk is higher than the 20% risk of relapse estimated in patients with CFH variants free of ESRD in the pre-eculizumab era (1,3), which is probably due to the fact that most patients with severe cases of CFH-aHUS are currently rescued from ESRD with the use of eculizumab and thus, may be more prone to experience relapses. Patients with MCP variants represent the second group of patients with an equally relatively high risk (50%) of relapse after eculizumab discontinuation. This risk is, however, similar to the one estimated in the pre-eculizumab era (1). Compared with those in patients with CFH variants, relapses in patients with MCP variants tended to occur later after eculizumab discontinuation (>1 year in two of four patients), but the median time to relapse after eculizumab discontinuation did not significantly differ between patients with CFH variants and those with MCP variants. Most interestingly, none of the patients with no detected complement genes variants had aHUS relapse after a relatively long median follow-up (17 months). Thus, in this group of adults and (more rarely) children, benefit-to-risk ratio tips in favor of eculizumab discontinuation after 6 months of treatment and stabilization of renal function. Our series does not provide sufficient data for patients with C3, CFI, or factor B variants or anti-FH antibodies. Nevertheless, the decrease in the titer of anti-FH antibodies below a pathogenic threshold of 1000 IU/ml, usually using immunosuppressive drugs, may allow the discontinuation of eculizumab treatment with monitoring of anti-FH antibodies, such as in patient 21 and limited previous cases reports (7,21). Taken together, our findings indicate that genetic workup provides crucial information to determine the optimal duration of treatment, although it does not affect the decision to start eculizumab in patients with aHUS (25). An algorithm for eculizumab discontinuation in patients with aHUS can be derived from these results (Figure 2) but remains to be tested in prospective studies. Proposed algorithm for eculizumab discontinuation in patients with atypical hemolytic uremic syndrome (aHUS). Insufficient data are available for patients with complement factor I, C3, and factor B variants. Ongoing prospective trials will certainly help refine this algorithm. MCP, membrane cofactor protein; CHF, complement factor H. *Immunosuppressive treatment is to be maintained until 6–12 months of aHUS remission with anti-complement factor H (anti-CFH) antibodies <1000 AU/ml. In all patients who experienced a relapse, eculizumab was rapidly resumed, and thrombocytopenia and AKI rapidly resolved. All relapsing patients recovered their baseline renal function without additional CKD or increased proteinuria. This was true in not only patients with MCP variants, who usually retain normal renal function despite the repetition of relapses, but also, patients with CFH variants with a more severe phenotype. Also, no extrarenal manifestation occurred during aHUS relapses. However, our patients were very closely monitored, a strategy that allowed a rapid diagnosis of aHUS relapse and restart of eculizumab. Thus, the adherence of the patient to the monitoring and the rapid availability of eculizumab in case of relapse are crucial for treatment discontinuation. The unanswered question in the patients who relapsed after eculizumab discontinuation is the duration of retreatment: lifelong regimen or on-demand treatment after aHUS relapses. The irreversible infraclinical renal damage that may result from the repetition of aHUS flares (as in patient 14) has to be taken into account in the management of patients with aHUS. A kidney biopsy may help to assess infraclinical kidney damage. Nevertheless, prolonged treatment does not preclude early aHUS relapse, such as in patients 7, 9, and 11, who received eculizumab for >2 years and experienced a relapse <6 months after treatment discontinuation. Our study has limitations. It included a rather limited number of patients with a limited duration of follow-up, and it was on the basis of a single country’s registry data. A single patient included had a potential extrarenal aHUS manifestation (pancreatitis in patient 28), and it remains unknown if the presence of extrarenal manifestations (neurologic or cardiovascular events) affects the decision to discontinue or not discontinue eculizumab. National and international planned or ongoing prospective studies with eculizumab discontinuation will provide additional clinical information and may help identify potential biomarkers of complement activation and endothelial cells damage predictive of relapse. Recently developed in vitro assays that measure, using patients’ sera, complement deposition at the surface of microvascular endothelial cells are a promising tool (10). In all, eculizumab discontinuation seems safe in patients with no documented complement genes variants after 6–12 months of treatment. 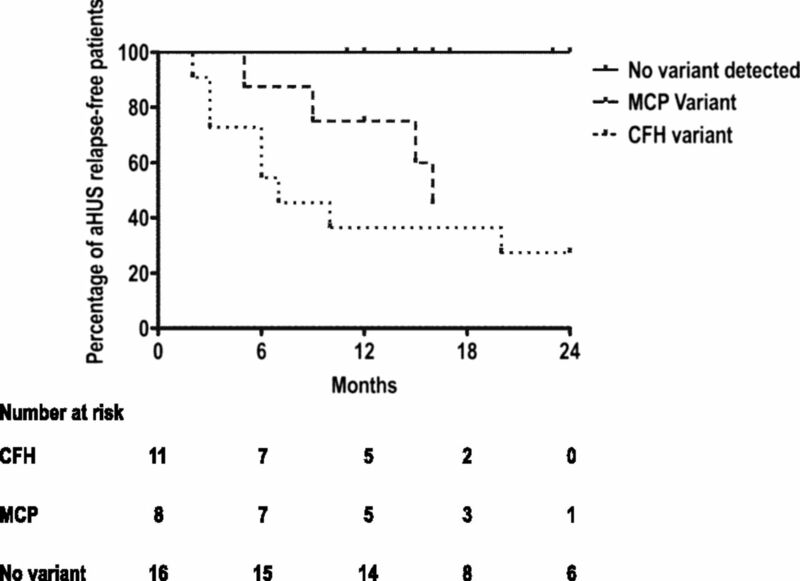 In contrast, patients with CFH variants and patients with MCP variants have a high risk of relapse after eculizumab discontinuation. These data will help clinicians identify the optimal candidates for treatment cessation, but they raise the challenging question of retreatment strategy in those who relapse after eculizumab discontinuation. F.F., F.P., E.R., C.L., and V.F.-B. received fees for participation in advisory boards, experts meetings, and/or teaching courses from Alexion Pharmaceuticals. This article contains supplemental material online at http://cjasn.asnjournals.org/lookup/suppl/doi:10.2215/CJN.06440616/-/DCSupplemental.